The Center for Interactive Research on Sustainability building (CIRS) aims to do more than simply reduce the negative environmental impacts that typically arise from the construction and operation of a 60,000 sf building. CIRS’ goal is to have its existence make the environment better. Not only does CIRS capture rain to supply 100% of its water needs, it also generates a purified water surplus that is shared with the UBC campus. Furthermore, it aims to go beyond a net zero carbon footprint. CIRS expects to reduce the amount of carbon that would have been released into the atmosphere if it didn’t exist. It employs a three-part strategy toward achieving this. First building design and operation procedures minimize energy requirements. Second CIRS captures energy from the sun, from the ground, and from the neighboring Earth and Ocean Sciences (EOS) building’s waste heat. 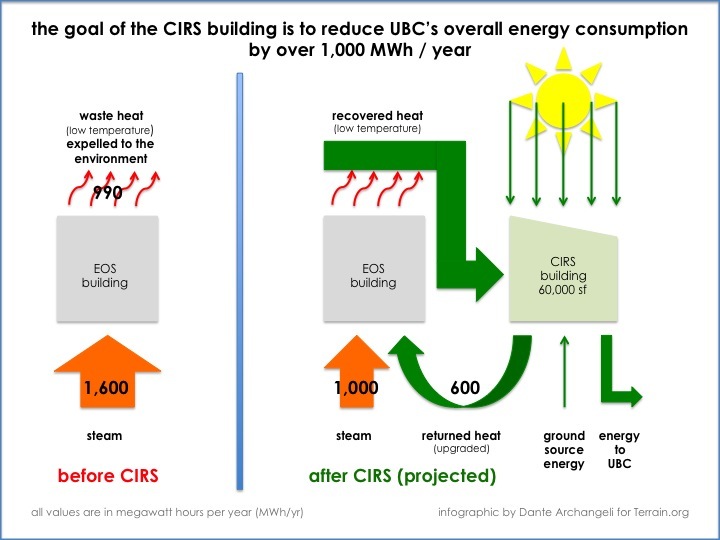 These sources provide more energy than CIRS needs for its operations so it returns energy to the OES building and the UBC campus. Finally the carbon sequestered in CIRS’ heavy timber structure is calculated to be more than the carbon released into the atmosphere by CIRS’ construction, including the manufacturing of everything within the building. To ensure that sequestered carbon is unlikely to be released into the environment in the future, CIRS is designed so that in the building can repurposed rather than demolished. If demolition is ultimately performed, the structure is assembled in a way that will facilitate easy deconstruction so that the wood timbers can be reused. The original version of this post first appeared as part of a longer article in Terrain.org. Previous PostTrees increase youth and financial securityNext PostNature smacks down Beyoncé. Will Kim be next?